You are here: Home / Frugal Living / Why Should I Plan A Weekly Menu? Why Should I Plan A Weekly Menu? This week I am out of town, so there is no menu plan. Instead, I thought I’d take a few minutes to discuss the process of making a menu plan. I can practically hear your thoughts from here. You know, I used to be just like you. But I was wrong. So, so wrong. Menu plans are one of the best things that have come down the pike in home organization. Having a dinner plan helps me have a more relaxed evening with my family. It really only takes a few minutes of effort and thought to put together, and the plan totally removes that frantic 4:30 “Oh NO! What am I going to cook for dinner” panic attack. I have found that loosing the anxiety has more than made up for any loss of spontaneity. Menu planning has saved me a lot of money over the years. When I plan menus, I can use items that I have on hand, or else plan in the time and trip necessary to pick up additional items at my favorite discount stores. When I don’t menu plan I find myself running out to the locally owned, extremely high priced grocery store to pick up ingredients that I need at premium prices. If you see that chicken on sale, go ahead! Buy it and throw it in the freezer to use in next week’s menu plan. Menu planning has also drastically reduced the amount of wasted food in our house-now I notice what is lurking in the crisper drawer and use it up before it passes the point of no return. Remember, wasted food is wasted money! Menu planning is very simple! 1. Take a quick look in the refrigerator, freezer and cupboards to see what you have on hand, and what must be used up that week. 2. Take a look at your calendar to see if you have any special considerations that week. Maybe you already have dinner plans-no need to plan a meal that night. Or perhaps you have appointments that will keep you out of the house all day-that isn’t the night to place a complicated dish with lots of prep time. 3. Decide on the meals using the considerations above. I cook, so it is easy for me to just pull various meal ideas out of my mental file. If you aren’t good at thinking up meals you can browse through your favorite cookbooks, or even check out past menu plans that other folks have used. 4. Write out the plan. I simply list out the days of the week, then start filling in the meals. Of course the special consideration meals go first. Have a day with not a lot of prep time, the crockpot meal goes there. Just going to be me and the kids, breakfast for dinner (or another meal the kiddos love but that doesn’t jazz Yankee Bill). The chicken in the fridge is only good for another 2 days? Stick that on Monday so it gets used up. That’s it. Not a hard process at all! If plans change, or you just don’t feel like eating that spaghetti on Wednesday, simply drop the meal, or rotate it with another day. 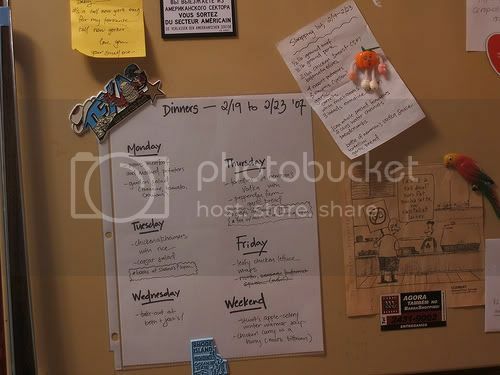 I’ve been knowntot make Wednesday’s dinner on Monday and then shift everything else from the week down. . .It’s not like the menu police are going to come and arrest you or anything. Menu planning is a guideline for your own use and convenience, not a law carved in stone. So if your friends call up and invite you over for dinner, toss the plans for curry out the window and go have some fun. You can still be spontaneous. I challenge you all to make a menu plan this week, then come back next week and let me know how it worked out! Who is in??? « Are You Gardening in 2009? I’ve been thinking of tryiing to menu plan now that I’m at home with Toots all day. I love menu planning. It makes things go so much more smoothly around the house. I don’t plan our meals out by day, but every week I plan 4 or 5 meals, and we have them as we want them, with considerations for when certain food needs to be eaten by, if either of us have meetings or appointments that make quick meals necessary. I like to build plans for leftovers into our menu–there are certain meals I know make enough for two nights, so we’ll just have something else in between. its also very helpful to me because i buy meat on sale and freeze it. if i don’t know what i’m having at least by saturday, the meat never thaws in time. I’ve always meant to do this and I can see why it’s so important but never have gotten around to it. I am going to do it this week and let you know next week how it goes. And now each Monday when I read your post I’ll see yours and it will remind me to do mine. Thanks for the motivation! I use menu planning in my household with great success. I find that weeks where I don't stick to a plan of some sort seem much more haphazard and rushed. All of that said, I also am a "mood eater." I need flexibility. It's actually really easy to build flexibility into a menu plan–I work in swap-out possibilities and always have at least one "from the pantry" kind of meal that can be made if I forgot to take something out of the freezer, forgot to soak my beans overnight, or some other thing has the menu plan sidetracked. I also find menu planning indispensable when dealing with my dietary restrictions. I literally chart out all of my meals & snacks–I just have to go to the list and see what I'm supposed to have for my snack. Keeps my blood sugar moderated, tummy happy and no binging. It was especially useful to plan that way when I worked–I'd grab pre-made frozen quiche or flax muffins, hard-boiled eggs and pre-measured snacks before my commute. I am obsessed with my menu plans, but it is because I love the ease it brings to my life if I have ideas in mind for what to make. I also find it fun to try new recipes and keep things fresh in our kitchen. It brings me a lot of joy to provide a healthy meal for my family and to share recipes with my friends and family. i started menu planning for the first time last week and I’m hooked! I loved the ease. It’s my new ‘gotta do’ every week. Before i thought it would take too much work, but i do like you, look at what i’ve already bought and take it from there. I also love menu planning! My boyfriend and I fell off the wagon a bit, so to speak, since Thanksgiving, but we got back on track this weekend, and it’s been great so far. No wondering what’s for dinner each night, no ordering takeout or going out because we’re too tired to think, shop AND cook, and lunches get made the night before from leftovers. Our evenings are free to watch movies or do whatever we want, and we don’t have to go to the store until the weekend. My friends so tease me about my menu plan. I have a whiteboard monthly calendar that I use. I start planning at the beginning of the month. I usually plan 3-4 meals per week. As the weeks come closer, I fill in the missing days. Definitely at least 2 nights a week are leftovers (more this week, 'cuz hubby on a business trip, and it's hard to cook with a toddler). I belong to a CSA, so I have to leave some leeway – never know what veggies we'll be getting. But I *love* the menu plan. I almost never stress about what to make. If I run out of a leftover before I thought I would, then it's PB&J or grilled cheese for a night. I totally agree. I started doing this and I write what we’re eating on a small posted note and tack it in the kitchen. It’s only me and my husband but he just told me how much he liked knowing what was going on and what we were eating and avoiding the temptation of getting a frozen pizza or something else unhealthy. I’m finding it to be super easy. I just started my first meal plan last week, and it makes me feel much more relaxed about our meals. When I end up working on evenings that I was planning to cook, we just eat leftovers, and I push the meal to the next day. Leanne-I hope you tried it, menu planning really is helpful. Brooke-another great point. I too get most of my meat from the freezer, and the planning has helped immensely with the defrosting process. Sharla-can’t wait to hear how your menu plan went. I bet you’ll be hooked. . .
Amanda-I never considered how helpful menu planning must be for a restricted diet. I love your idea about the snacks-I have a healthier eating goal, and planning at least 1 snack a day would help. . .thanks! Amy-I always found deciding what to cook to be the most stressful part of dinnertime. The menu plan really does make my life go more smoothly and easily. MasterpieceMom-glad to see a new convert! Marcia-those who tease just don’t understand 🙂 Your life is probably less stressed then theirs. Rosemarie-It really is easy, isnt it? I don’t know why we all assume it will be hard. For me, deciding at 430 what to eat is much harder. Lisa-so glad it’s working for you. keep up the good work. I started the year off with ONE RESOLUTION this year – to plan a WEEKLY menu! My 1st week was AWESOME! Mon: Leftovers, Tue: spagetti & salad (even made homemade EASY breadsticks), Wed: baked chicken breasts, acorn squash in microwave & wild rice, Thur: Baked pork chops, baked potatoes, carrots & applesauce, Fri: MOM over and SHE made a pot roast in the crock pot so, I moved my Fri to Sat: Grilled drumsticks, french fries & bbq beans, Sun: Lasagna & salad … WHEW! That was SO EASY! Looked through the freezer and frigde (about 5 minutes) … made MENU! Soooo NICE not doing the 430P BLANK STARE! Got Hubbie on board to do this week’s MENU but, he just put down the MAIN dish! so, I added the side dishes! I am lovin’ this NEW FOUND FREEDOM! and I am NOT a COOK by any stretch! Mom of Boys-I am so glad that your first week of menu planning went so well. It’s true-folks think that menu planning will be restricting, but really it brings FREEDOM! cilantro and pineapple. Strange, different and kids seem to enjoy variety.